Here we go! Spencer O'Brien on the course! 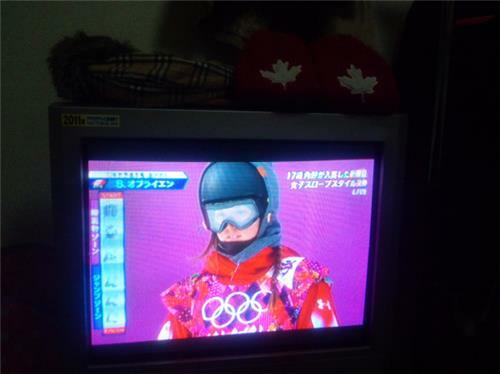 It's all good, she can channel Mark McMorris. Don't worry. This course is so unforgiving, you really have to be in control the entire way. The judges have shown that they want perfection from these riders. Snowboarding culture is so chill. Fans having the best time at the bottom of the course. Next up is rider #10, Jamie Anderson of the US. There are 12 women in the final. Top score from either of the two runs wins. So Spencer O'Brien still has a shot. One good run. That's all it takes. so much suspense!!! finals for @spencerobrien you can do it! #BringHomeGold #GoCanadaGo !!! Cheering hard for both @spencerobrien and @TorahBright tonight. Second runs will have to be LARGE. Anna Gasser, the last rider is now re-strapping in to re-start her run. Clean on the rails and...sticks first kicker. Not the smoothest run for Anna Gasser. 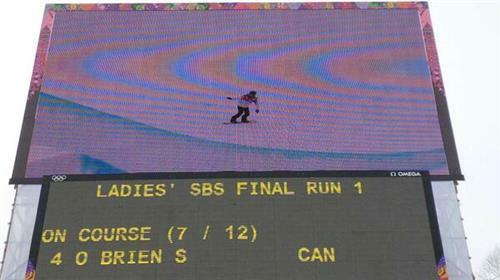 O'Brien sits in second last position after run 1. @spencerobrien canada is proud of you! #canadianpride #haida big smile!! Ok Spencer is just chilling, waiting for her second shot. It amazes me how collected freestyle athletes are. And Norendal goes down hard. She's ok, but getting out of her board. Looks like she missed the grab. That'll definitely count her out of the medals.